Recently the Wink-Loving ISD Board and Superintendent team, Team of 8, attended the 18th Annual Winter Governance and Legal Seminar (WGLS) hosted by the Texas Association of School Boards (TASB) in Corpus Christ, Texas. 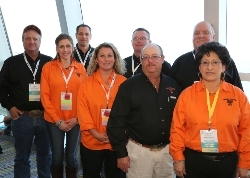 The conference offers focused trainings for Texas board members for earning their required annual continuing education credit requirements. By attending this conference, all the Wink-Loving ISD Board Members have exceeded the required hours of continuing education for this school year (school year 2015-2016). WLISD’s Team of 8 was one of only three boards to have 100% presence (all board members and the superintendent) at the conference. As a result of this commitment, TASB took a team photo which is currently showcased in the TASB Winter Governance and Legal Seminar Press Photos Release for 2015 and may be published in future magazines or other media publications such as in next year’s 2016-2017 Winter Governance and Legal Seminar annual brochure.